22.10 The proportions of a normal distribution occupied by plus or minus one, two, and three standard deviations from the mean. deviations (x ± 2s) includes approximately 95% of the measurements, and the mean plus or minus three standard deviations (x ± 3s) includes approximately 99% of the measurements (IFigure 22.10). 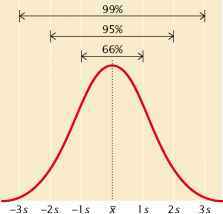 Thus, only 1% of a normally distributed population lies outside the range of x ± 3s.